Occupy Wall Street and hence Occupy Portland was started as a union based astroturf movement in the service of President Obama and as a foil to Mitt Romney and the Republicans–you know, the evil wall streeters. Now they’re setting the table for another, new offensive. The President has spent trillions to give to his buddies in stimulus and bail outs. We haven’t even begun to pay off on those bills. Austerity hasn’t yet begun. But once again, like the blank slates they have always been, the Occupy turned PLOC-ers have now come up with a new schtick to protest: Austerity. Put another way, the free spenders in DC have put our economy into a tail spin and now the Occupiers want to keep the tap wide open. And now, as Laughing at Liberals shows you here, the Occupiers/PLOC-ers/Anti Austerity have now been taught from their union pay masters how to construct blockades to cops. fought to the consulate, ‘n scaled th’ wall. led them to safety, ‘n stood at th’ gate. but we stood fast to bar th’ door. 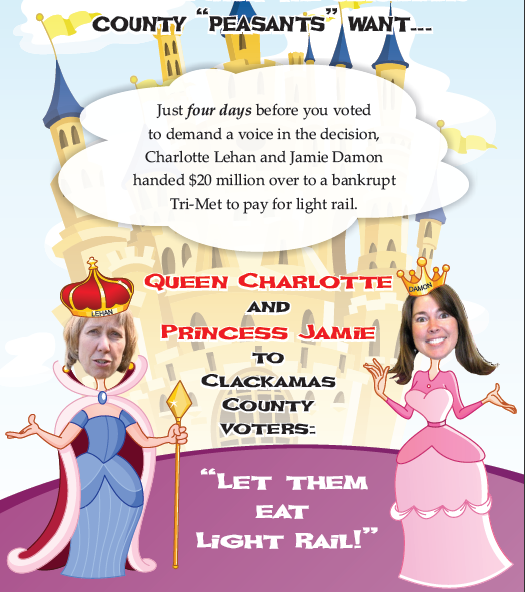 Oregon Iron Works (rail car maker) and others who would benefit from extending Loot Rail into Milwaukie buy a hit campaign against the people trying to stop it. In a laughable piece of graphic theater, the loot rail backers say Ludlow didn’t pay his wife what he owed, blamed HIM for Charlotte Lehan (his political foe) removing him from a planning commission, and says he had a lien on his house. False. 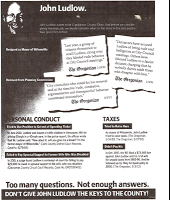 Paid his ex wife everything he owed, the lien was satisfied in the 1980’s after being put on for mere days and, well, I think you can figure out why Charlotte Lehan–Ludlow’s opponent in this race–would want him off a planning commission. And it’s exactly the reason why you should vote for him. 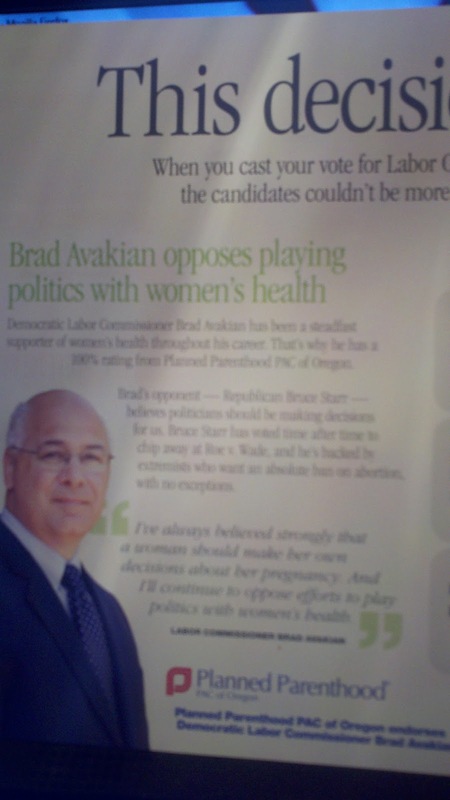 Planned Parenthood uses your tax subsidies to help out the campaign of LABOR Commissioner Brad Avakian. This is supposed to be a non partisan race but Avakian, of course, is a reliable lefty–no matter what is called for in the job. Still, ponder this: When has Planned Parenthood been in the business of LABOR? Usually they’re trying to prevent a woman from going into it. 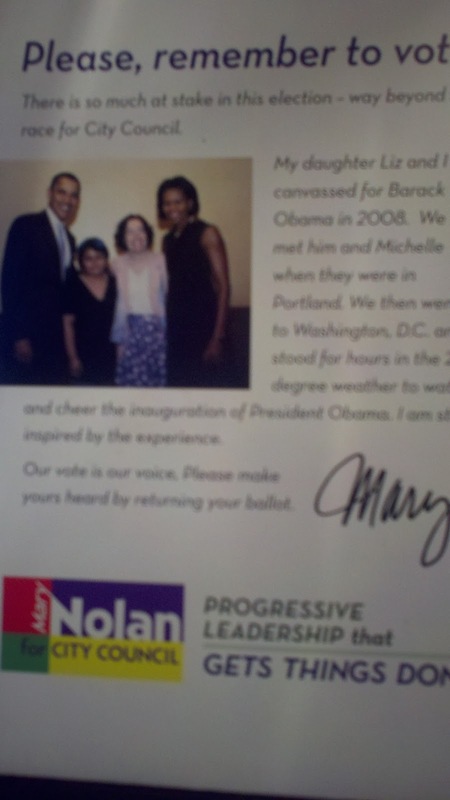 Mary Nolan is running for Portland City Council against Amanda Fritz. She’s seen nearby posing with the President and first lady. Nolan must have coughed up some big bucks to do that. You recognize the name because she’s the one we highlight in the show a lot because of the phone message she left for a lobbyist threatening his … job? life? And then there’s this: This is the way you get light rail shoved down your throats. You say ‘no’ on the ballot three times and then the builders and backers of light rail flood the zone with money calling people ‘bully’ and nutty and wrong. For those of you who say ‘Well they’ve already started it, guess there’s no fighting it’ you’ve been played. How many unfinished free overpasses are there around here? A few. They’ve done it before and they can do it again. Is it a quid pro quo? 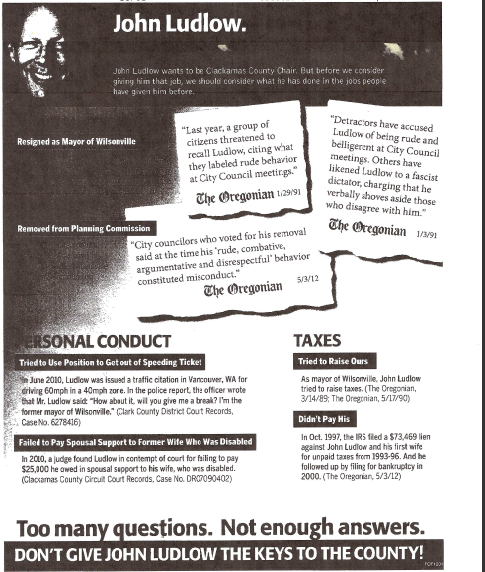 This new PAC is sending out personal attack mailers and running TV ads against Ludlow. It’s cold blooded pay back racketeering for the commissioners who paid TriMet the $20 million 4 days before the voters could intervene. Is there any doubt this money was promised before they voted to pay TriMet? Don’t let the late hits cause you to vote against your own values. Keep fighting. Vote for Revenge Or Vote for Love of Country?